There's something to be said for quitting while you're ahead. Instead of releasing album after album with decreasing quality and impact, being satisfied with a more limited body of work that holds up decades later. That's the musical legacy of the band behind the future number 1 single which made its debut on the ARIA chart this week in 1989. Two studio albums (four years apart) and a new track on a best of collection seven years later - and that was it for the British trio. Meanwhile, a band I wished had even less of a musical legacy ascended to the number 1 spot on the Australian singles chart this week in 1989. The Proclaimers, who I recently included in my look back at two-hit wonders of the 1980s, began a five-week run at the top with "I'm Gonna Be (500 Miles)". Before BZ featuring Joanne (and Redzone) but after Elisa Fiorillo had a go of this song about "Jack-jack-jackie", the British group fronted by Lisa Stansfield released a version as their final single. Taken from the Francis Ford Coppola biopic Tucker: The Man And His Dream, starring Jeff Bridges as Preston Tucker, this was part of a full soundtrack album recorded by Joe Jackson. Acid house never really took off in Australia - at least not on the singles chart - with this debut single by D-Mob falling way short of its UK top 3 performance. Falsely advertised as a UK top 10 single (The Primitives did have a top 10 hit - just not with this song), "Way Behind Me" was another jingly-jangly ditty for the British indie band fronted by singer Tracy Tracy. The song came out between two albums by the group, Lovely and Pure, and has ended up being included on both. I doubt anyone could have guessed what a phenomenon this duo would become back when they were launched onto an unsuspecting public with this debut single. A top 10 hit in the UK in 1988 and a future US number 2, "Girl You Know It's True" was the first of five big global hits fronted by Fab Morvan and the late Rob Pilatus. It was also the song they were busted lip syncing to, resulting in their eventual exposure as frauds. I still like the song and don't really care who was actually performing on it, but plenty of people did care. There's a link to the music video in the song title above, and a shockingly mimed Grammys performance below. This gave Taylor her highest-charting hit to date in the US (reaching number 2), but in Australia, it became her second single on the trot to miss the top 50 (following ballad "I'll Always Love You"). I didn't mind too much - I liked both "Tell It To My Heart" and "Prove Your Love" much more than either of those other two singles from her debut album. Taylor would return to the top 50, but not for over a year. While Pet Shop Boys were in the middle of a hot streak of 10 consecutive top 10 hits in the UK, they were only scraping in to the Australian top 50 with the singles from the Introspective album. This one was co-produced by Trevor Horn, who'd been behind ABC and Frankie Goes To Hollywood's biggest hits, and would go on to help launch Seal's solo career. Another song from the soundtrack to home-grown "comedy" Young Einstein, "Dumb Things" was, as it turns out, also used in a Hollywood film in 1989. Starring long-term Scientologists John Travolta and Kirstie Alley, Look Who's Talking featured the song - the only difference being it was credited to Paul Kelly & The Messengers in the States. "Dumb Things" had actually been around for a while, first appearing on Paul's 1987 album, Under The Sun. 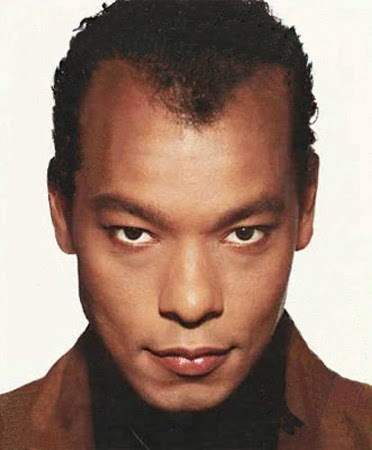 About two years since we'd last heard from them (with Buzzcocks cover "Ever Fallen In Love"), Roland Gift and the other two returned with the first taste of their second album, The Raw And The Cooked - and it was obvious from first listen that this was going to be big. In fact, it would easily eclipse anything on their first album (their previous highest-charting song had been their remake of "Suspicious Minds") and become their biggest single, as well as one of 1989's highest-selling songs in Australia. I've never realised this before now, but the iconic music video was choreographed by French dancer Philippe Decouflé, the same guy who did New Order's "True Faith" - he obviously had a thing for guys in weird costumes jumping. And so the Rick Astley backlash began. After dominating the Australian charts in late 1987 and 1988 with a string of singles from Whenever You Need Somebody, Rick couldn't even crack the top 40 with the second release from follow-up album Hold Me In Your Arms. This is actually my favourite song of his and was also his last single to be produced by Stock Aitken Waterman. Throughout their extensive career, British reggae troop UB40 have had their greatest success with cover versions - but this original track was actually their third biggest Australian hit of the '80s (following covers "I Got You Babe" and "Red Red Wine"). The second single from their self-titled eighth studio album, "Where Did I Go Wrong" and the subsequent singles from UB40 didn't do so well in the UK, which probably explains why their next album would end up being the second volume in their Labour Of Love remake series. Single number three from Australia's new favourite band was their most upbeat track to date - and their first to miss the top 10. On the upside, album ...ish was firmly ensconced in the albums top 10 and would stay there for months (including a three-week spell at number 1 in May). Like Berlin, Will To Power was actually a dance band (in this case, a freestyle group) who became most associated with a big ballad single. For Berlin, it was "Take My Breath Away" and for Will To Power, it was this medley of Peter Frampton's "Baby, I Love Your Way" and Lynyrd Skynyrd's "Freebird". Like so many acts from Florida's freestyle scene, some of Will To Power's vocals left a lot to be desired - specifically those by founding member Bob Rosenberg rather than this track's featured vocalist, Suzi Carr, who'd go on to release mid-90s club hit "All Over Me". In 1991, Will To Power would return to the Australian top 40 with another remake, "I'm Not In Love" (originally recorded by 10cc). Improving on the peak position of debut single "Don't Need Love" by one spot, Johnny Diesel and his band were Australia's second favourite new band - and one of my least favourite acts of 1989. It was bad enough having one Barnesy - did we really need two? Next week: a song that should have been released months earlier finally came out as a single and one of the best ballads of the late '80s debuted. Before then, I'll kick off my countdown of my favourite songs from 2001. The ballad I think you're referring to which debuts next week was released here in late '88... and peaked at #80 on the AMR chart in Nov '88 before falling out of their top 100. That being said, I'd never heard it (or even heard of it) until purchasing the '1989 Be Happy' compilation on which it featured, in December '88. The track was later recycled as a 'bonus track' on 'Hits of '89 Volume 2'. Womack & Womack's 'Teardrops' suffered a similar fate, though getting its second (and consecutive, actually!) compilation appearance on 'Hits of '89 Volume 1'. 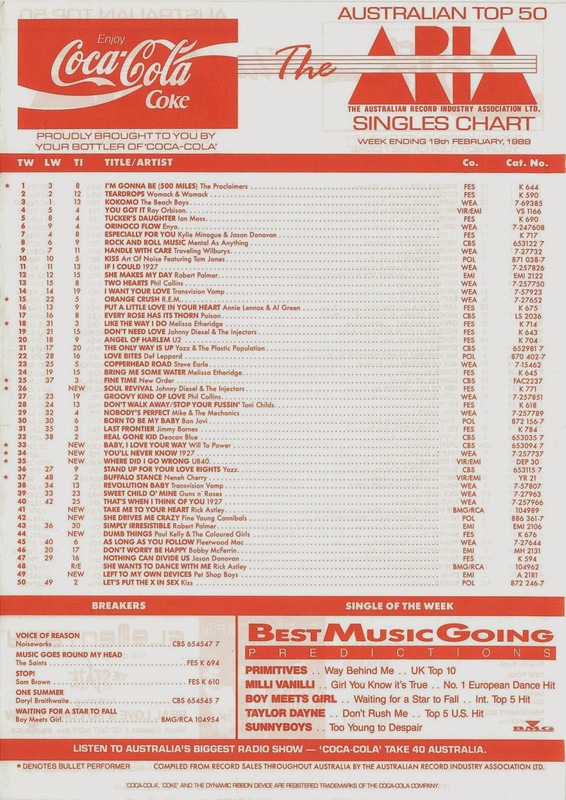 It's interesting that none of 'Dumb Things', 'She Drives Me Crazy' and 'Take Me To Your Heart' received a bullet upon their top 50 debut... yet none were listed as breakers in the preceding weeks, implying that they were all at least below #55 the week before. I remember there being a TV ad for Taylor Dayne's 'Tell It To My Heart' album around this time, highlighting 'Don't Rush Me' as the new single. Yet it propelled neither into the top 50. I love the Tell It To My Heart album - my number 11 of all time. I just wasn't crazy about the 3rd and 4th single choices. Better albums tracks. Taylor Dayne would take the US by storm with her second album 'Can't Fight Fate' and the singles that were lifted from it. Similar to Australia, but we were snapping up the album on the back of just 2 hit singles from that album. I still like Milli Vanilli regardless of who sang the vocals. I can never get sick of 'Girl I'm Gonna Miss You' and 'Blame It On The Rain'. LoL. The other singles, take it or leave it. All the songs in this Top 50 and the following weeks, remind me of doing work experience in Yr.10 and working at a music shop in the city. I think every 3rd person was buying 'Ish', 'Johnny Diesel & The Injectors' or 'Watermark'. Oh Eric Weideman how he made my 14 year old heart beat. Especially in the brief glimpses of him in a singlet in the You'll Never Know clip. It's a travesty that Take Me To Your Heart flopped! It's one of his best S/A/W song - though completely stolen from Inner City's "Big Fun". And "Way Behind Me" by The Primitives is a song I still adore, I had to get it on 7" vinyl about 10 years ago as I couldn't get the darn song any other way at the time. I really love Don't Rush Me by Taylor Dayne but admit it's not Tell It or Prove Your Love. Left to my own devices is one my all time favourite PSB songs. Should have been a bigger hit here. I don't think I heard the Blue Zone track at the time, but the BZ featuring Joanne & Redzone versions from '98 sounded familiar, so I must have. The dance mix uploaded here is even better IMO - https://www.youtube.com/watch?v=vQynpLEEVTM .